On last week's episode of Arrow (season 3, episode 18), titled "Public Enemies," the walls closed in on Oliver Queen after League of Assassins cosplayers dressed as the Arrow framed him for the murder of Starling City's latest Mayor, among other victims. Ra's al-Ghul himself revealed the Arrow's secret identity to Captain Lance, prompting him to publicly declare that Oliver Queen is the Arrow and issue an arrest warrant. Oliver turned himself into police custody, but Roy Harper, the Arrow's sidekick Arsenal, decided to cosplay as the Arrow himself, attacked the police caravan, and de-hooded, announcing that he was the Arrow. I tend to agree with Mr. Shatner. That was also my reaction when I saw Roy's gambit. But is Roy really a fool to confess to being the Arrow? If Roy remains in custody and this goes to trial, how could Roy possibly convince a grand jury that he is the Arrow and was all along? True, Roy Harper possesses intimate knowledge of Oliver Queen's activities as the Arrow, but could he ever sustain his story under serious questioning? What about Team Arrow, Oliver's accomplices? And how does what Captain Lance know about Team Arrow, including his daughter Laurel being one of them as the Black Canary, affect the case? So many questions. With no new Arrow on this week, I figured I’d take the opportunity to wade back into those murky waters that are the Starling City legal system and analyze the ramifications of Roy Harper’s “I’m the Arrow” gambit. First, since Roy’s motivation is to save Oliver, the important question is not whether or not Roy can prove he is the Arrow and was the Arrow all along. The question is, can the Starling City District Attorney (let’s just assume Laurel is not handling the case for simplicity’s sake) prove that Oliver is the Arrow in light of Roy’s public unmasking? Or, more accurately, can the DA prove that Oliver Queen actually committed one of the crimes being attributed to the Arrow. Presumably, he is not being charged with “being the Arrow” but rather with the murders that the League of Assassins Arrow cosplayers committed, in particular the killing of the mayor. 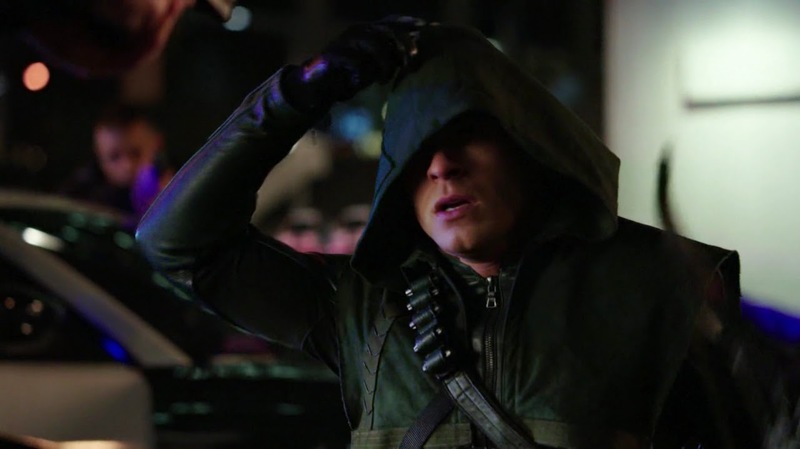 Even before Roy claimed to be the Arrow, what was the evidence that Oliver was the Arrow in general and that he killed the mayor in particular? Captain Lance got the arrest warrant for Oliver because Ra’s Al Ghul told Lance that Oliver is the Arrow. Since Ra’s isn’t going to offer that testimony under oath in a court of law, that’s inadmissible. What else is there? Oliver didn’t actually confess. He voluntarily turned himself in after Lance got an arrest warrant with his name on it for killing the mayor. That’s not a confession; that’s a smart move for an innocent person to make (as opposed to running and making yourself look guilty). Even in the police wagon with Lance, Oliver never came right out and admitted to being the Arrow. There was talk of the island and why he came back to Starling, but not an outright confession to being the Arrow, let alone to killing the mayor. So when Roy shows up in full Arrow gear and admits to being the Arrow, there is no way to prove Oliver is the Arrow – let alone that he killed anyone as the Arrow – beyond a reasonable doubt. But Roy’s stunt really wasn’t necessary. Oliver should have just walked into police headquarters, denied being the Arrow, and dared them to try and prove otherwise (after destroying all evidence in the Arrow Cave). But, now that we are left with Roy in cuffs as the Arrow, what happens to foolish Mr. Harper?